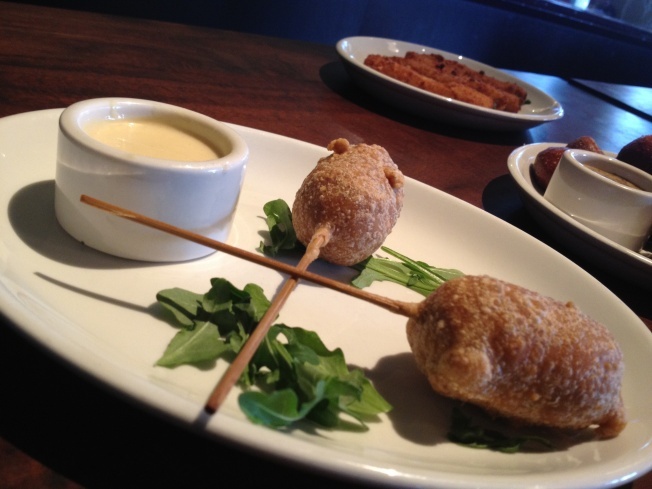 Mini corn dogs with spicy mustard at AT&T Park restaurant Public House. San Francisco's Mission Bowling Club opens to the public on March 19 with a draw that goes beyond knocking down pins. The six bowling lanes (with three available for advance reservation) are sure to be hard to get, but there's more than enough room to come in and eat from chef Anthony Myint's playful menu, which includes stick foods like a sausage corn dog with jalapeño crema, entrees such as a French onion casserole, and snacks including an "everything" pretzel with lardo mostardo. Myint, something of a local culinary visionary and the co-author of the book Mission Street Food: Recipes and Ideas from an Improbable Restaurant, will also share dishes that have previously earned him a cult following. This including the "Mission Burger," a beef patty that's been aged and granulated, a fine dining technique, and is served with caramelized onion, Monterey jack cheese, and caper aioli. This is likely to be a place where people come just as much for the food. Meanwhile, over at AT&T Park's Public House restaurant, new chef Chris Wade (who previously cooked at Prospect) has also applied thoughtful techniques to a new menu of appetizers, unleashing elevated comfort offerings like potato chip crusted mac and cheese, loaded potato croquettes fried in panko flakes and potato skins, chorizo and jalapeno fritters, and bratwurst sliders made from local butcher 4505 Meats. When it's not a game day, these fun appetizers (normally $3-13) will be half price from 4-6 p.m. alongside $5 draft beers, wine, and well drinks. And when the Giants are in session, everything from the menu, including entrees like a pressed Cubano sandwich or beer battered fish and chips, is available to grab and duck right through the restaurant's convenient entrance to the park. Given that food is a sport in itself around here, It's getting harder and harder to find lousy food in San Francisco — even at a game.